Fish sticks are the only thing I ever ordered as a kid. Something about the crunchy out side and the flaky middle. Dipping it into anything and being able to eat with your hands. 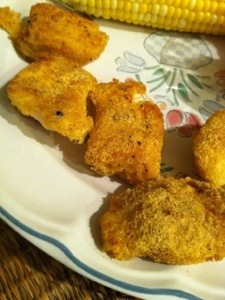 I have yet to find a fish stick gluten free that I like until I made my own. This recipe got a boyfriend stamp if approval so we know its good. Mix corn meal, garlic, onion, salt and paprika in a bowl and pour onto a flat plate. In the bowl whisk egg and milk. Now cut fish into strips or large chunks. Dip each piece into egg and then roll in corn meal to coat. Place each piece on a sprayer foil baking sheet. Cook at 400 degrease for 10-15 minutes and turn half way until golden brown. Enjoy!